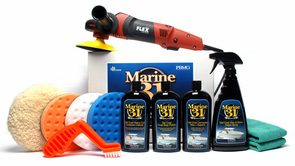 Home > Shop by Brand > Marine 31 - Waxes, Cleaners & Polishes > FLEX PE14-2-150 Marine 31 Boat Oxidation Removal Kit Free Bonus! FLEX PE14-2-150 Marine 31 Boat Oxidation Removal Kit Free Bonus! The ideal kit to restore the most neglected boat finishes! The FLEX PE14-2-150 Marine 31 Boat Oxidation Removal Kit is the professional choice for restoring neglected gel coat finishes! The FLEX PE14-2-150 Rotary Polisher offers serious power with a lightweight design to cut through heavy oxidation with ease. When used with the FLEX PE14-2-150, the low dusting, easy-to-use Marine 31 polishes quickly remove oxidation, reviving your gel coat's glossy shine. Matched with selected Lake Country Wool or CCS Foam Polishing Pads, these polishes are extremely efficient. To protect the shine you have created, the FLEX PE14-2-150 Marine 31 Boat Oxidation Removal Kit includes Marine 31's Carnauba Wax + Sealant and Wax & Shine Detail Spray. These ecologically friendly products will help you keep your boat looking great no matter the sea's that lay ahead. The FLEX PE14-2-150 Rotary Polisher is every professional or enthusiasts dream when it comes to working on gel coat finishes. The powerful motor will cut through the heaviest oxidation with ease while the lightweight body and ergonomic design reduce user fatigue. The FLEX PE14-2-150 only weighs 5.6 pounds! Boat surfaces can be quite large. 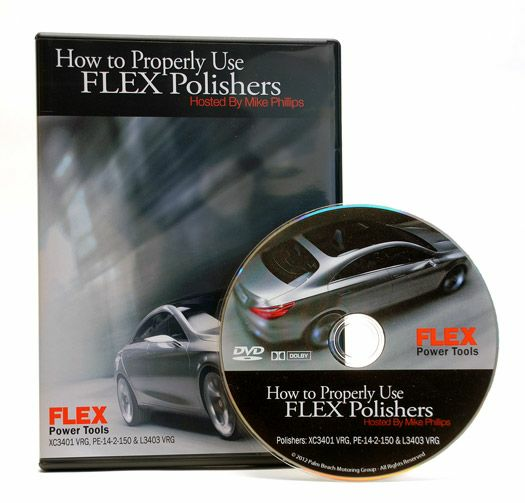 Go with the lightweight polish that is big on power by selecting this kit with the FLEX PE14-2-150 Rotary Polisher! The Buff and Shine Rotary/Circular 6 Inch Backing Plate works with the FLEX PE14-2-150 Rotary Polisher in this kit to securely mount 6.5 inch and larger polishing pads. The molder urethane lip gives this backing plate just enough flexibility to contour to any curves you may encounter while restoring your boat's finish. The Lake Country CCS 6.5 Inch Black Finishing Pad is firm enough to polish yet gentle enough to leave the paint perfect. This pad is perfect for applying a thin even coat of Marine 31 Gel Coat Carnauba Wax + Sealant! A total retail value of $635.87. You save $100.88!